This story was written by CBS News' Sarah Mirza. It's a popular image, favored by college girls for dorm room adornment and trotted out of photo archives near Valentine's Day. A meeting of three strangers - the photographer, the nurse and the sailor - developed into one iconic photograph. Japan had surrendered and World War II was over. It was August 14, 1945, and Alfred Eisenstaedt was chasing subjects around Times Square in New York City, photographing joy, relief and a whole lot of smooching. For decades the identity of the kissers remained unknown. In 1995, Edith Shain came forward, claiming to be the nurse. Eisenstaedt accepted that it was Shain he had photographed 50 years earlier. Shain passed away of liver cancer in her Los Angeles home on Sunday, according to her son Michael Shain. The second half of the photo's mystery still endures. Several men have laid claim to the smooching sailor's identity, three of whom have valid stories or proof. CBS News' Sarah Mirza spoke to one of them, Carl "The Moose" Muscarello, Wedsnesday. Now 84, Muscarello is twice retired, first from the New York Police Department and again from American Express, where he worked as a fraud investigator. "I'm saddened that she's gone,"Muscarello said of Edith Shain. "She was 91. How many people are going to be 91?" Muscarello said he and Shain kept in touch for a while but had drifted apart. He first met Shain in Los Angeles, after one phone conversation. Muscarello's arrival at Shain's doorstep, flowers in hand, came as a surprise to the former nurse. The way Muscarello describes their meeting, Shain took the flowers, double-checked his identity and slammed the door, leaving him outside. She re-opened the door 5 minutes later, her face made up, ready to receive a stranger she may (or may not) have kissed so many years ago. Muscarello said Shain asked him leading questions about that August day, gauging his legitimacy. Questions like "why didn't you call me after I gave you my number? "and "Where did we have dinner that night?" Muscarello answered them properly - no phone numbers were exchanged and no dinner date occurred that night. After the kiss "I just backed away and disappeared into the crowd," he said. Muscarello found out he was in "Life" when his mother, flipping through magazines in a doctor's waiting room, spotted her son and identified him by a birthmark on his right hand. "What are you doing kissing strange women?" his Sicilian mother later asked. 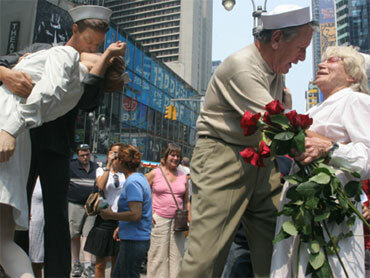 But, as Muscarello remembers of that hectic day in 1945, "if you didn't get kissed, there was something wrong with you." These days Muscarello spends his time playing golf and visiting his grandchildren. His wife Shelly is still working as a flight attendant at age 71. Muscarello said he spoke to Shain's son earlier today. "I'm sad that we drifted apart," he said.